3 bedroom caravan. Sleeps 6. Close to beach. 3 bedroom caravan situated on Park Resorts Camber Sands. Sleeps up to 6 people. One double bedroom and two twin bedrooms. Fully equipped kitchen with fridge, microwave and cooker. Large living area with television. Dining area. Separate toilet and shower room. Car parking. Located next to beautiful Camber Sands beach. On site entertainment including swimming pool (subject to opening times). Long or short term renters welcome. No smoking allowed. Ideal quieter spot. Close enough to entertainment area but far enough that you cant hear it. Super communication prior to holiday. We arrived a little early but were able to get into the caravan at 2pm - the caravan is clean, comfortable and well equipped however due to the age of the van it is showing signs of wear (main doors not aligned, interior handles coming off doors and taps not working/turning off easily). 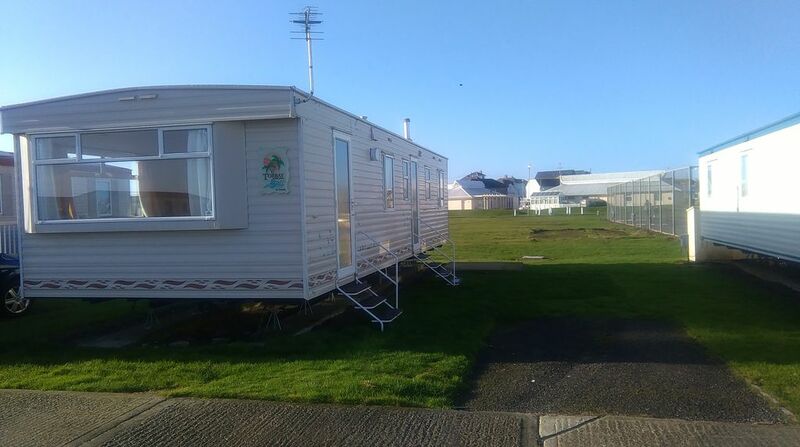 The location of the caravan is fantastic, close enough to the beach and the complex; it seems to be in an owners area so never had any issues with noise etc. It does back onto the camping field but again never heard anything. A fantastic base for a holiday at a can't be beaten price! Be prepared to have a drive to go anywhere on a day out....we visited Battle Abbey and that was a good 50 mins away. Rye is nice but not loads to do there and then there is nothing much else within easy reach! Near to the beach and not too close (for noise) to amenities-a 5 min leisurely walk tops! Quiet situation very close to beach. We were pleased to find the caravan set in a quiet location, surrounded by what seems to be owner/occupiers. This meant that our two very young grandchildren could go to bed fairly early and not be disturbed by the sound of other children still out playing. The caravan itself was clean and well equipped and the owner had removed one of the bunks, as requested to get a travel cot in. It was very close to the beach and that made it easy when carrying all the beach provisions and equipment. The only improvement I could suggest for the actual caravan owner would maybe be the provision of some outdoor furniture, as this would have meant we could eat outdoors when self catering. Although I appreciate that storage could be a problem. Close, clean and warm sea and impudent gulls. Love my holidays there! Huge and clean caravan, lot of space. Close to beach. Thank you, Alexandra!